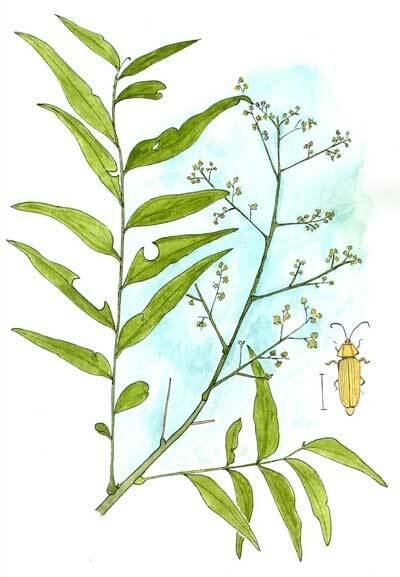 Watercolor from live specimen found in the Pinal Co., Arizona. Lycid beetles, one illustrated at right, are one group of insects likely to be encountered on the flowers. In addition the leaf shows round and oblong segments cut out by leaf-cutter bees. TREE : A small tree often growing in copses. Bark of young branches is pale gray. Older bark is darker gray or brown and is fissured. FRUIT: Unique fruit is a glassy, golden sphere with a very hard seed inside. The fruits contain saponins, a toxic detergent that has been used for it's cleaning ability. FLOWERS: Panicles of numerous, small, white flowers appear in May and are highly attractive to insects of all kinds, especially bees. LEAVES: Pinately compound leaves with an odd number of 7 to 17 leaflets. The leaves are alternate on the stem (ashes have similar leaves but are opposite on the stem). RANGE : This tree is sporadic on rocky desert foothills from about 1000 m and higher in elevation. Their presence suggests a reliable underground water source. Found in southwestern Arizona and Sonora and thence eastward through Texas and the southeast United States.